I AM! This blog documents the many unexpected things containing coconut. Agh! I hope this putting coconut oil in meats stops really soon. Can you imagine having allergic reactions to random pizza at parties or for take-out? Luckily, I have only seen coconut oil in pepperoni in Volpi brand pepperoni. And it is only maybe in there depending on whether palm or coconut oil is cheaper at the given time of production. Stay safe, coconut allergic friends! Closys toothpaste has sadly changed its formula! Our coconut allergic people can't use your toothpaste anymore. It's true, the formula has changed on us and now "sodium lauroyl sarcosinate" is in the ingredients. I looked on my old tube that is half full still and it's definitely a new formula now. Their might be a few old tubes on amazon with the old ingredients, but beware, they may have just not updated the ingredients yet on third party sellers. THIS. Coconut free lotion is what fills my inbox almost daily with emails begging for ideas, help. . . asking what to use for certain conditions, multiple allergies, on babies, on scent sensitive kids, and the list goes on. Despite being able to use these generic ingredients, I miss "real" lotion. 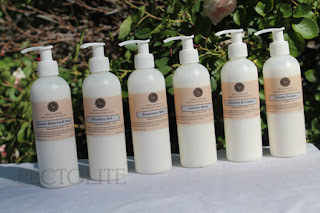 But, there is a new one that just came out from Pectolite called none other than "Coconut and Palm Oil Free Body Lotion". Pectolite sent it to me to try out and I've been using it for a couple of weeks once the cold chapped air finally got to me and I'm happy to report it is really good stuff. The lotion absorbs well, isn't greasy at all, and is long lasting. Some of you with bad reactions to petroleum products might especially enjoy it. My lotion was completely unscented and it just smelled faintly of olive oil. You can order it in several scents that their coconut free soaps also come in. I did have to shake it up after it sat for awhile since I didn't use a pump and it has a tendency to separate a little bit. I didn't use it on my face, but it moisturized and was very healing on my hands, legs, and even feet! My skin seemed rejuvinated and it never made me itchy or red! Bath Geek has just introduced a coconut free line of soaps and other products like bath bombs! They sent me a couple soaps to try out and these are a little different than other soaps out there. They are 100% olive oil Castile, which has a reputation for feeling a little slimy, but used in some applications the form of lather also has some benefit. For example, they are awesome for shaving with because slimy is good when you want it to have a lubricant for your razor! And honestly, they hold together much better than the Kiss My Face Olive Oil Soap. Bath Geek's soaps use a sugar and multiple-lye formula. Lye and potash soap doesn't mean it has lye in it- it means that that is what is used to change the oil into soap. I noticed that they pack a powerful cleaning punch! For example, my magicmarker-stained three year old girl came out cleaner than usual as did the super dirt stained knees of my six year old boy. They are nice slippy slidey coconut free soaps. However, I found they can also could be a little more drying than other soaps, but this might be due to the cure time of the soap since the ones I got were super fresh. Go ahead and try them out- they are having a special sale for all of us who are allergic to coconut! Offer expires Valentines Day 2018. PS- Bath Geek's owner, Ai, has a really informative blog with all kinds of nerdy things about allergies! For example, check out this post about Glycerin and Allergies. A new shampoo find- it has soap nuts! 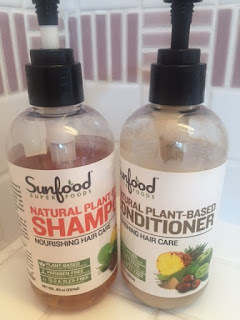 People with coconut allergies are always looking for new shampoos! Here is one that contains soap nuts. Thanks to Amy for finding this! She says that the conditioner smells like barf but it works well. Also, they contain apple cider vinegar. Read the reviews on the page and you can see that it might be worth the money. Non-stick Cooking Spray Alert- PAM now contains coconut! Nooooo!!! PAM, you have failed us. WHY did you add coconut to your original pan spray? It's NOT original pan spray anymore. The original didn't have coconut in it. Beware, everyone. Always read labels, even of things you have used for years and years! Aargh. That was a close call. I'll be sticking with the store brands for now. I found that after a couple of years my favorite sls-free or coconut-free toothpaste products have come and gone, so it is time for an update on the toothpaste scene. I want to start by reminding everyone to be aware of the many sls-free toothpastes that are also flouride free. This may not be what you are looking for if you are into cavity prevention. The only times I have ever gotten cavities in my life is when I used flouride-free, sls-free toothpaste. So maybe flouride and sls are both considered poisonous to some people who also demand that all of their products be made by solar power. However, I find that one of the points of brushing my teeth is to NOT get cavities while at the same time NOT dying from an allergic reaction. UPDATE! As of March 2018 the original Closys now contains a coconut derived ingredient! 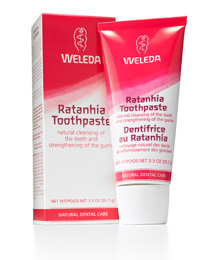 Weleda Ratanhia Toothpaste - it's got a rare medicinal plant (that thank goodness isn't related to coconut). Calcium carbonate is a main ingredient. There is NO flouride, however. About $8. Water (Aqua), Calcium Carbonate, Glycerin, Magnesium Aluminum Silicate, Alcohol, Flavor (Aroma)*, Krameria Triandra (Ratanhia) Root Extract, Commiphora Myrrha Resin (Myrrh Resin) Extract, Xanthan Gum, Ammonium Glycyrrhizate, Limonene*. Tom's of Maine used to have such awesome toothpastes that they have now taken off the market. They have only kept their flouride-free sls free ones, but sls-free does NOT mean coconut free in these new pastes, unfortunately. Booo! Original Closys now contains "sodium lauroyl sarcosinate"! Please comment with your favorite toothpaste! Or invent your own so that we don't have to spend a fortune on this stuff. I am not a medical doctor. Any advice I give should not be considered medical advice. Please consult with a doctor if you have medical questions. Follow me and be coconut free!